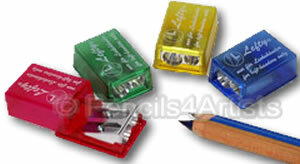 This great double holed sharpener is made especially for left handed people. Will sharpen standard pencils as well as larger gauge pencils. The sharpener is made of milled magnesium alloy with a plastic container for catching the shavings.